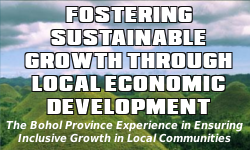 A joint venture undertaking of Pacific Consultants International (PCI), in association with Planning Resources and Operations Systems, Inc., and the Provincial Government of Bohol. Notwithstanding all the infrastructure developments and tourism products/programs, the importance of sustaining its natural and cultural heritage will always be a key priority in the planning and development of tourism in Bohol. Thus, it is in this context that the Provincial Government of Bohol (PGB) has initiated the preparation of a Tourism Master Plan (TMP), a plan that would be a unified direction for the Province to further harness and sustain its vast tourism potential. The plan is available in PDF format. The Main Report provides a unified direction or plan for the province to further harness and sustain its vast tourism potential. The plan is organized around six (6) sector components, namely: the physical (structure plan and the transportation infrastructure plan); the environmental management plan; the conservation management plan; the entrepreneurship development plan; the various sustainable development proposal; and the critical implementation plan. The Interim Report highlights a summary of projects in support of the tourism development framework plan. (Annex A) Details of the outlined projects (project profiles) are included as Annex B. Note that some of these projects were selected from the priority tourism projects of the LGU. (Annex C) These proposed projects are an offshoot of the Bohol Tourism Master Plan; a summary of which is provided in the succeeding sections for context. in your report, how come Antequera is included in section 2.1.3a as sandy beaches, well in fact it is landlocked? Please correct it. Thanks! Thanks Jay for your comment and observation. You’re right Antequera is inland not coastal. I think it should have been Alburquerque not Antequera as part of the southern seaboard together with Loay. But we cant correct it as of now, its a pdf file that we got from the consultant. Hi. I would just like to inquire when the Tourism Master Plan Main Report was published? 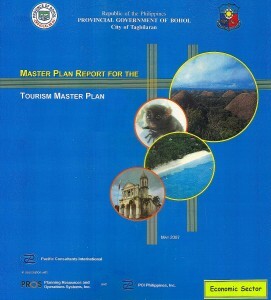 The Bohol Tourism Master Plan Vol.1: Main Report is dated May 2007. Hi, is the file corrupted? Can’t open the zip file. If it’s not much of a hassle, can you send me a copy over my email? Thanks. Hi Ria, I just downloaded the file and opened it fine. The download is a 47 MB file which may take a while and can easily get corrupted with an unstable internet connection. If this is your case, I suggest you use a download manager. Of course you also need an archive manager to be able to extract the PDF contained in the zip file, before you can open it on a PDF reader. We find it necessary to pack this in a zip file because very often, the browser will attempt to open the PDF within itself. However, it would take too long to open because of its size and usually, users think the file is corrupt because nothing is happening on your browser for a while. Unable to open the Tourism master plan main report after downloading- it says the file is corrupt. Please advise or email me a copy of the same. Thx. Hi, I have just downloaded both Main and Interim Reports. It took a while to download but they opened just fine. Just, in case, you still need to extract/unzip the zip file before you can open the compressed PDF file. I am making a thesis for my final year in UP Diliman, on this especially given the recent disaster that transpired. Is there anyone I can contact when I visit Bohol to interview regarding the contents of this tourism development plan? Thanks! Hi NJ, you may contact Ms. Jo Cabarrus, head of Bohol Tourism Office (BTO) and Atty. Lucas Nunag, chair of the Provincial Tourism Council (PTC) for the recent Bohol Tourism Recovery Plan, which is a roadmap to support the recovery of Bohol’s tourism sector after the 7.2M earthquake last 15 Oct. 2013. Hi Willy, i downloaded both the TMP and the Interim Report but both of the files does not contain the Tables (Figures). i wonder why? We updated the files and now contains the missing figures. They were mostly maps that were prepared outside the document and were inserted in the hard copies. We edited the PDF and inserted the maps and a table. Thank you for the heads-up. If you notice more missing items, please feel free to notify us. You may now download the document again for the updated version. Hello, may I inquire on the recent developments regarding Bohol-Palawan/Puerto Princesa Tourism and Environmental Programs and Development Policy Exchange? Is there any resolution or document released on this matter, and if yes, can this be accessed? Please kindly check your email, We sent you already the Memorandum of Agreement (MOA) of the Bohol-Palawan Tourism Policy Exchange. Thank you.